Sonoma County has a Mediterranean climate with a hot, dry summer. And, while we may have an occasional fall/winter downpour—or, even, a rare El Niño winter, scientists predict that an overall drought condition will persist throughout California for many years. You may be wondering if you can have a food garden with limited available water. The Food Gardening Specialists (FGS) of the UCCE Sonoma Master Gardeners believe that the answer is, “Yes!” All you need to do is to scale planting to your family’s likes and needs, and to apply water-wise strategies to your vegetable garden. These strategies are demonstrated by the FGS in the video below. 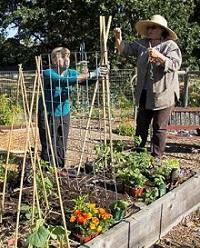 Left: Master Gardeners Susan Shaw and Kathy Matonak construct teepees for vertical gardening. How Much Water Does My Food Garden Need?